“Do You Hear What I Hear?”, one of the few Christmas songs written after 1960 to become a true seasonal standard on a par with classics such as “White Christmas,” was the product of an interfaith couple’s mutual concern for the fate of the world during the Cuban missile crisis in 1962. That listeners and critics often missed its true intent was an oversight that gnawed at the songwriters. "I am amazed that people can think they know the song--and not know it is a prayer for peace," co-writer Noël Regney said in an interview in 1985. "But we are so bombarded by sound and our attention spans are so short that we now listen only to catchy beginnings." Regney, who died on December 2, 2002, wrote the song in 1962 with his wife, Gloria Shayne Baker, as a clear and plaintive plea for peace when the world teetered on the brink of nuclear war during the Cuban missile crisis. "Do You Hear What I Hear?" was released shortly after Thanksgiving in 1962 by Harry Simeone Chorale and sold more than a quarter-million copies during that year’s holiday season. Bing Crosby’s version, regarded as definitive, was released in 1963, became a worldwide hit and sold more than a million copies. Since then the song has received more than 120 covers in styles ranging from pop to jazz to funk to New Age to reggae. Regney was born in Strasbourg, France, on August 19, 1922, and studied at conservatories in Strasbourg, Salzburg and Paris. War interrupted his education in classical music, as he was drafted into the Nazi army despite being a Frenchman. He soon deserted, joined a group of French resistance fighters and became a double agent working for France. While still with the Germans, he once intentionally led his platoon toward a group of French partisans and was shot. Bing Crosby, ‘Do You Hear What I Hear.’ Written by Noël Regney and his wife, Gloria Shayne Baker, the song expresses the writers’ fears over the fate of the world as it teetered on the edge of nuclear war during the Cuban Missile Crisis. Crosby’s 1963 hit single was a worldwide hit, selling more than a million copies and making the song one of the few seasonal standards written after the 1950s. After the war, he served as musical director of the Indochinese Service of Radio France from 1948 to 1950, then later worked as director of the Lido nightclub in Paris. In 1951, he left France to take a world tour as musical director for the French singer Lucienne Boyer. In 1952, he settled in Manhattan and gravitated to the TV world, where he was employed variously as an arranger, composer and conductor. He also wrote radio jingles. He met his future bride by happenstance, after wandering into the dining room of a Manhattan hotel where she was playing the day’s pop hits on the piano. He introduced himself and, following a whirlwind month-long romance, they were married a month later. Though they continued writing separately, the couple also collaborated on several hit songs, with Shayne Baker usually crafting lyrics to Regney’s music. One of their first hits was Bobby Vinton’s 1962 #12 single, “Rain Rain Go Away,” and Jo Stafford recorded their “Sweet Little Darlin’.” Shayne Baker’s other writing credits include James Darren’s #3 1961 single “Goodbye Cruel World,” and talk show host Mike Douglas’s only Top 40 single, 1966’s “The Men In My Little Girl’s Life,” which she wrote with Mary Candy and Eddie Dean. With Jerry Keller, who had written and recorded one of the all-time great summer hits, “Here Comes Summer,” she wrote “Almost There,” recorded by Andy Williams in 1958. With Soeur Sourire (Sister Smile), known as the Singing Nun (neé Jeanine Deckers), Regney wrote the French language song “Dominique,” a Top 10 hit single in eleven countries (#1 in the United States, in late 1963-early 1964, and was the second foreign language song to reach #1 in the U.S. that year, following Kyu Sakamoto’s evocative “Sukiyaki.” The song hit its peak U.S. chart position shortly after the assassination of President John F. Kennedy, when it was heavily programmed as the national mourned its fallen leader. “Dominique” is about Saint Dominic, the Spanish-born priest who founded the Dominican Order, of which the Singing Nun was a member. Soeur Sourire (Sister Smile), born Jeanine Deckers and best known as the Singing Sun, had a #1 single in 1963 with Noël Regney’s ‘Dominique,’ a song about Saint Dominic, the Spanish-born priet who founded the Dominican Order, of which the Singing Nun was a member. ‘Dominique’ hits its peak chart position shortly after the assassination of President John F. Kennedy, when it was heavily programmed as the nation mourned its fallen leader. 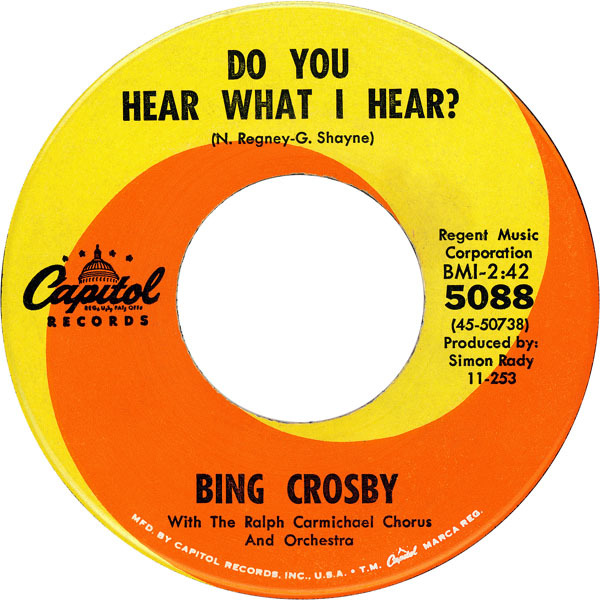 “Do You Hear What I Hear?” had its origins in an assignment for Regney to write a holiday song as the flip side of a single that was expected to become a hit. “I had thought I’d never write a Christmas song,” Regney recalled. “Christmas had become so commercial. But this was the time of the Cuban Missile Crisis. In the studio, the producer was listening to the radio to see if we had been obliterated. After returning home, Regney jotted down the lyrics, then asked Shayne Baker to write the music to accompany his words, the reverse of their usual process. “While walking down the street in New York, my mother heard trumpets playing the melody in her head,” says Shane Baker’s daughter, Gabrielle Regney. Regney and Shayne Baker divorced in 1973. The latter died at her home in Stamford, Connecticut, on March 6, 2008, at the age of 84.